Maj. Edward W. Scott, Jr. 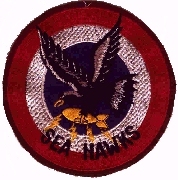 Note on the name "Seahawks" and logo: creation of the 63rd Seahawk name and logo occurred during the transition from B-17 Flying Fortress to the B-24, which took place with " The Scott Project ", a group of low altitude, radar-equipped Liberators dedicated to attacking shipping. Capt. Herbert Derr was the Squadron Commanding Officer who decided that a new identity was required, hence the creation of the "Seahawks" nickname. He and artist Thomas Rote created the design for the new squadron insignia. 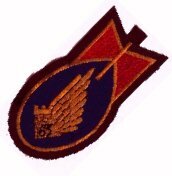 63rd Squadron Deaths Sort database by Squadron by double--clicking on the word "Squadron" at the top of the Squadron column. To return to this page, use your browser back button. Crew in front of B-17 "Old Baldy"
Crew in front of B-17 "Lulu Belle"
Ed Gammill in front of the B-24D "Pug"
Crew in front of B-24D "Pug"